It has been announced today, 26 February 2013, by the Minister of State for Defence Personnel, Welfare and Veterans Mark Francois that all the details have been confirmed for the Arctic Star and the Bomber Command Clasp and the application process has now opened. “All those who served our country in Bomber Command and on the Arctic Convoys deserve nothing but the utmost respect and admiration from us. That’s why I am delighted that these special individuals will in the next few weeks begin to receive the Bomber Command clasp and Arctic Star that they have so long deserved. The qualifying period for the Arctic Star is “service of any length” recognising the particular severity of the conditions experienced by those who served in the Arctic. Whilst the primary intent is to recognise those who served on the Arctic Convoys, eligibility is extended to include all who served north of the Arctic Circle in World War Two. 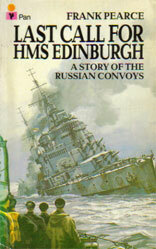 Those eligible will include members of all three Services as well of course as the Merchant Navy who crewed the ships taking the vital supplies to Russia. The criteria for the Bomber Command Clasp requires prior qualification for the 1939 to 1945 Star, to which it will be affixed, with the additional requirement to have flown at least one operational sortie with a Bomber Command operational unit. 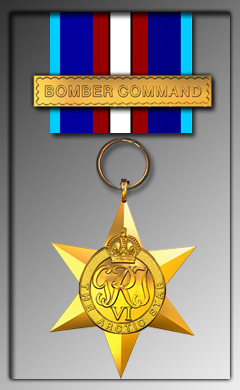 A clasp was deemed more appropriate, by Sir John, in the case of Bomber Command as aircrew had already received either the Aircrew Europe Star or the France and Germany Star and another medal would have constituted “double-medalling” for the same service. Equal stripes of dark blue to represent the service of the Royal and Merchant Navies, a red stripe to represent that of the armies, and a light blue stripe to represent that of Air Forces. To be worn with the dark blue stripe furthest from the left shoulder. 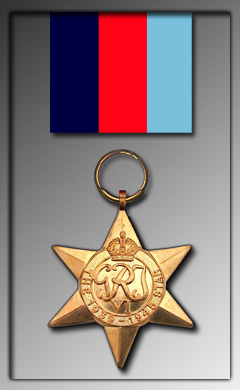 The 1939 to 1945 Star was awarded for any period of operational service overseas between 3 September 1939 and 8 May 1945 (2 September 1945 in the Far East). The criteria is 180 days’ service between these dates, although some special criteria apply when, at certain specified times, just 1 days’ service is required. Naval personnel qualify after 180 days afloat in areas of operations as laid out in the regulationsbetween certain specified dates. RAF air crew will qualify with 60 days service in an operational unit including at least one operational sortie. Air crew of fighter aircraft engaged in the Battle of Britain between 10 July and 31 October 1940 were awarded the Clasp ‘Battle of Britain’ to be worn on the ribbon of the 1939 to 1945 Star. The obverse of the medal shows the uncrowned head of King George VI. The reverse bears the Royal Crown resting on an oak tree, flanked by 2 lions above the words ‘The Defence Medal’, with the date 1939 top left and 1945 top right. Flame coloured in the centre flanked by stripes of green to symbolise enemy attacks on Britain’s green and pleasant land, with narrow black stripes to represent the black-out. 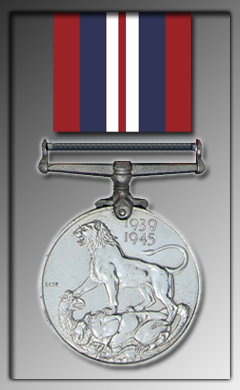 The Defence Medal was awarded for non-operational service. This type of service in the UK included those service personnel working in headquarters, on training bases and airfields and members of the Home Guard. Home Guard service counts between the dates of 14 May 1940 and 31 December 1944. 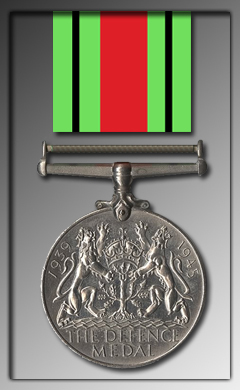 The Defence Medal was also awarded for non-operational service overseas, for example in India or South Africa. The obverse of the medal shows the crowned head of King George VI, while the reverse bears a lion standing on a dragon with 2 heads. Above are the dates 1939 and 1945. In the colours of the Union Flag, a narrow central red stripe flanked by narrow white stripes, wider blue stripes and then red. The War Medal was awarded to all full-time personnel of the armed forces wherever they were serving, provided they had served for at least 28 days between 3 September 1939 and 2 September 1945. A pale buff to symbolize the desert, overlaid with a central red stripe and one narrow stripe. Each of dark and light blue stripes represents the 3 services. 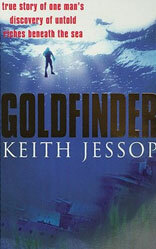 It is worn with the dark blue stripe furthest from the left shoulder. 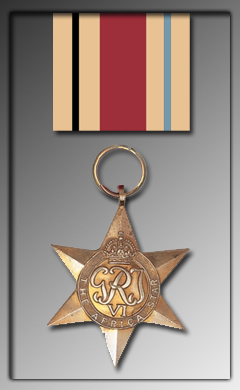 Star awarded for 1 or more days’ service in North Africa, Malta or Egypt between the above dates. The qualifying areas for the Africa Star also include the earlier areas of conflict against the Italians in East Africa; those serving in Abyssinia, Sudan, Eritrea, Kenya or Somaliland between certain other specified dates will also qualify. Naval personnel anywhere at sea in the Mediterranean or in harbour in North Africa, Malta or Egypt between the above dates will qualify. Those serving in direct support of the Eritrean and Abyssinian campaigns between certain other specified dates will also qualify. RAF air crew landing in or flying over an area of an Army operational command or flying over enemy occupied territory in North Africa will also qualify. Service with either the 1st or 8th Army in North Africa during certain specified dates will qualify for award of the ‘1st Army’ or ‘8th Army’ Clasp to be worn on the ribbon of the Africa Star. 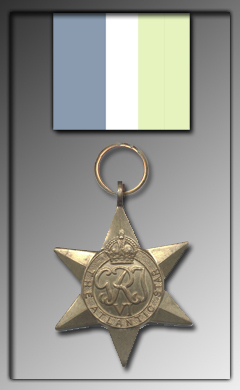 Provided neither the 1st or 8th Army Clasps have been qualified for, staff of the 18 Army Group Headquarters who served between certain specified dates under a specified General will qualify for award of the Clasp ‘North Africa 1942-43’. Shaded and watered stripes of blue, with white and green to represent the Atlantic. To be worn with the blue edge furthest from the left shoulder. Awarded only after the 1939 to 1945 Star has been qualified for, the Atlantic Star is for 180 days’ additional service as ship’s crew RN or Army) in home waters or the Atlantic. Certain special conditions apply governing award of the Star for those Naval personnel entering service less than 6 months before the end of the qualifying period, provided it was the last operational theatre in which they served. RAF air crew will qualify after award of the 1939 to 1945 Star for an additional 60 days service in an operational unit having taken part in operations against the enemy at sea. The Battle of the Atlantic took place between 3 September 1939 and 8 May 1945 as German U-boats attacked the convoys transporting valuable supplies from America and the colonies to Britain. Battleships of the RN and aircraft of the RAF escorted the convoys, hunted the U-boats and despite some notable successes by the U-boats, the Allies won a comprehensive victory in the Atlantic.